Former country recording artist Joyce Paul passed away this week at age 78. She died on Monday, Feb. 15, at the Sunrise Senior Living Center in Roseville, Minnesota. Her funeral and burial will take place in Nashville next week. 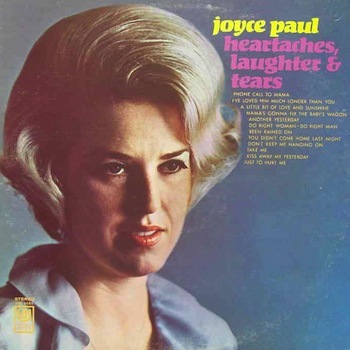 Joyce Paul is notable for her LP Heartaches, Laughter & Tears and her country hit, “Phone Call to Mama.” Both were issued by United Artists Records in 1969. She was born in Shelbyville, Tennessee, in 1937 and raised in Music City. As a teenager, she became a popular vocalist at the summer Centennial Park concert series. Joyce Paul was the “Discovery” singer there at a 1953 show headlined by Pat Boone. Also in 1953, she recorded for Republic, her first label. YouTube has a video of her singing “Your Cheating Heart” on a 1953 episode of the Country Style USA TV show. Paul was voted “Miss Cohn High” in 1955. After graduation, she attended Peabody College. She continued to sing in the Centennial Park summer concert series in 1956. She became the regular vocalist with the pop/swing ensemble the Red McEwen Band, opening for Brenda Lee in the park in 1958. Paul and the band also performed Centennial Park shows in 1959, 1960, 1962 and 1963. Joyce Paul was produced by Bob Montgomery and Kelso Herston on United Artists. She was showcased by the label at the 1967 country disc jockey convention. Joyce Paul was predeceased by husband Billy Potter. She is survived by son Lincoln Potter, daughter-in-law Cecelia Green and grandchildren Georgia Potter and Jackson Potter. Visitation will be Friday, Feb. 26 from 5-7 p.m. at Woodlawn-Roesch-Patton Funeral Home, 600 Thompson Lane. The funeral will be held there on Saturday, Feb. 27, at 10 a.m., followed by burial service and lunch reception.